Without the Federal Reserve Bank, there might not be ecommerce or even an Internet, which both depend on money. A century ago the country lacked the financial institutions to be globally competitive, let alone innovate in ways that characterize the 21st century. 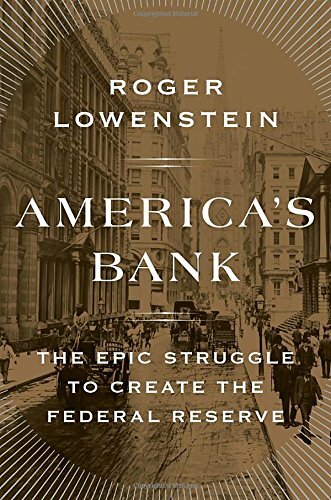 America’s Bank is Roger Lowenstein’s highly entertaining, informative, and readable chronicle of The Epic Struggle to Create the Federal Reserve. The first Bank of the United States was established in 1791, but closed two decades later when anti-Federalist forces prevailed in blocking continuing its charter. The Second Bank of the United States was established in 1816 but closed in 1836 as President Andrew Jackson vetoed its charter renewal. For nearly 70 years, the country floundered without the benefit of a strong central bank. A strong central bank can provide stability and buttress the financial systems, when and as needed. Indeed, it was the very role the Federal Reserve fulfilled in the 2008/2009 financial crisis. Without a strong bank to parent the misbehaving banks, things could have been much, much worse. Prior to creation of the Federal Reserve Bank, “America was a monetary Babel, with thousands of currencies; each state regulates its own banks and they collectively provided the country’s money.” Although the country operated on a hard money basis, that itself was problematic because too little gold was in circulation. In those times commerce was difficult, if not impractical “for anyone traveling to carry with him the coin necessary to meet his expenses for a protracted journey.” The problem of traveling with notes was that unless those notes were issued by banks in the leading financial centers such as New York, Boston, or Philadelphia, they would likely be refused or discounted. Roger Lowenstein is the Dean of Chronicling the Best and Worst of America’s Capital Markets—including books telling the story of Warren Buffet’s brilliance and success and the story of When Genius Failed about how Long Term Capital Management succumbed as too smart models designed by Wall Street gurus and Nobel economists did not account for black swan events. America’s Bank models authoritative scholarly research, drawing extensively on a trove of unpublished papers from the Library of Congress, the Morgan Library Museum, and university libraries at Virginia, Stanford, Yale, Harvard, and Columbia, research that is chronicled in 61 pages of illuminating end notes.